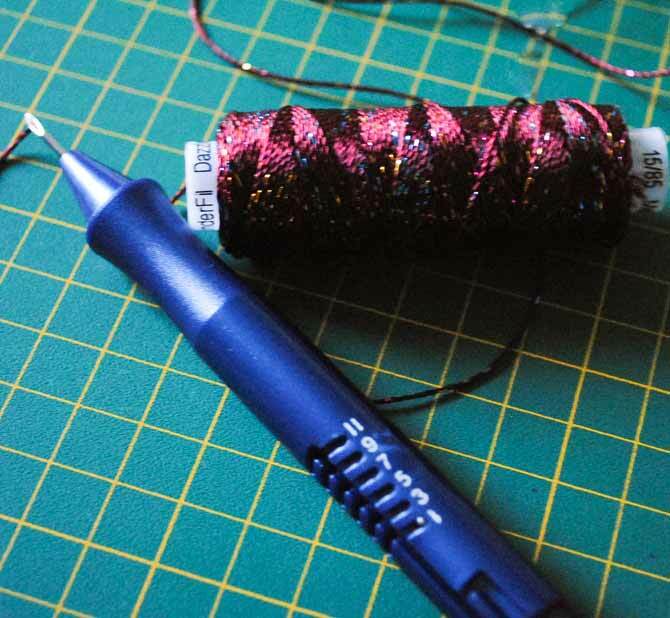 Yesterday on QUILTsocial I showed you how to do bobbin work using Dazzle thread from WonderFil. I loved how the bobbin work turned out using the shimmery Dazzle thread AND how I could put my free-motion quilting skills to use to embroider a beautiful butterfly design on the crazy quilt base. 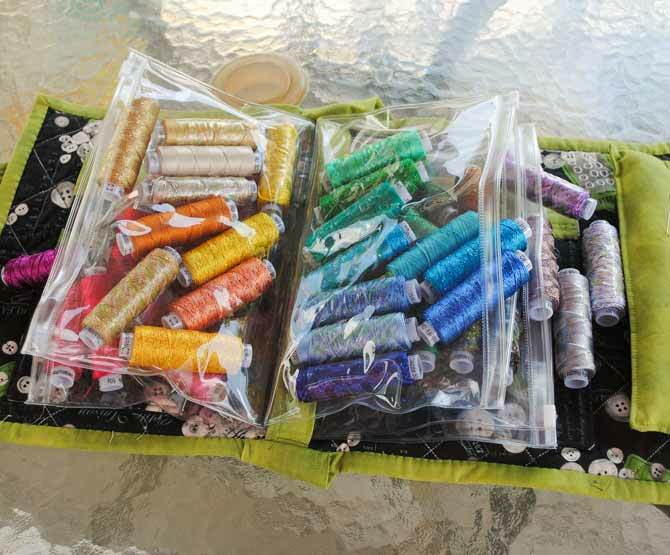 Today we’re going “sewing machine free” and I’m going to try out these threads for one of my favorite hand stitching techniques – punchneedle embroidery. I’ve done A LOT of punchneedle embroidery but I almost exclusively use embroidery thread. I’ve designed many patterns, had lots of projects in different magazines and have written my own pattern book called“Fresh and Fun Punchneedle”. 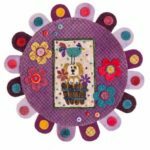 Polka Dot Dog punchneedle pattern. 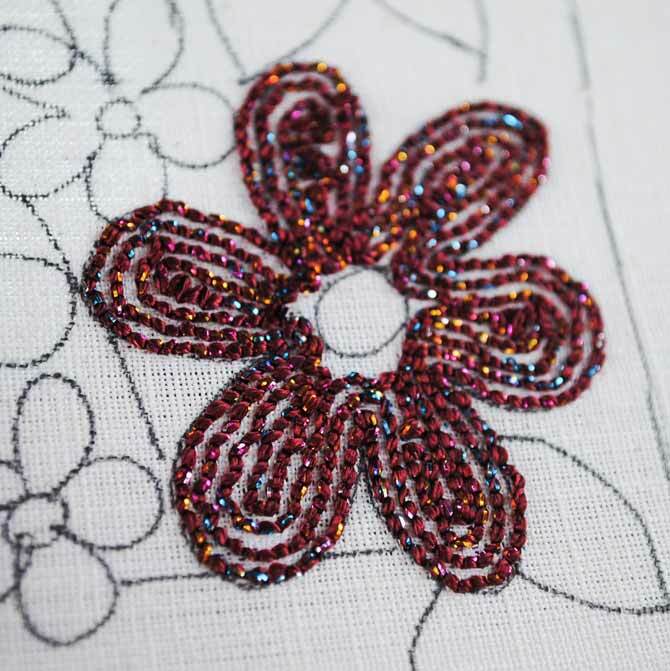 Seven years ago, I added a series of videos to YouTube which explain how to prepare your fabric design, how to thread the punchneedle and how to do the basic punchneedle stitch. I’ll add links to each of these videos throughout today’s post. That’s it! No machine, no electricity! Once you have your design chosen, you need to transfer it to your weaver’s cloth. The cloth is quite easy to see through, so I just put it over top of my design and trace it with a fine tip marker or mechanical pencil. Here’s my punchneedle, all threaded and ready to stitch! 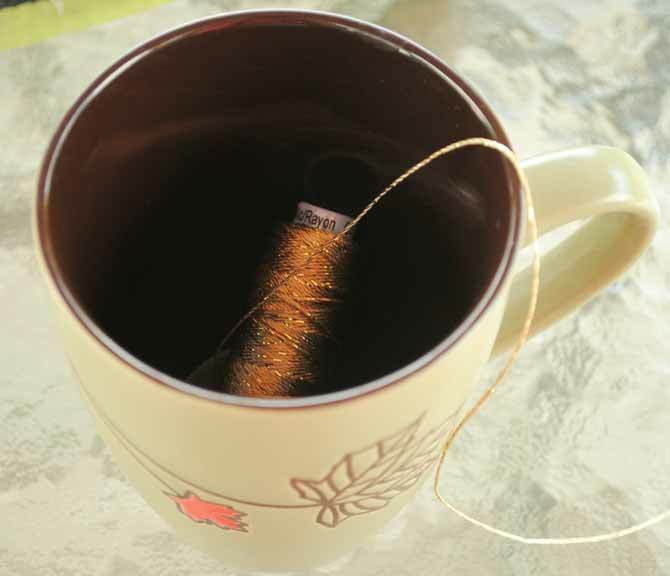 Helpful hint: Since we’re using the Dazzle thread on a spool, it helps to put the spool in a mug to keep it from rolling away while you’re stitching. 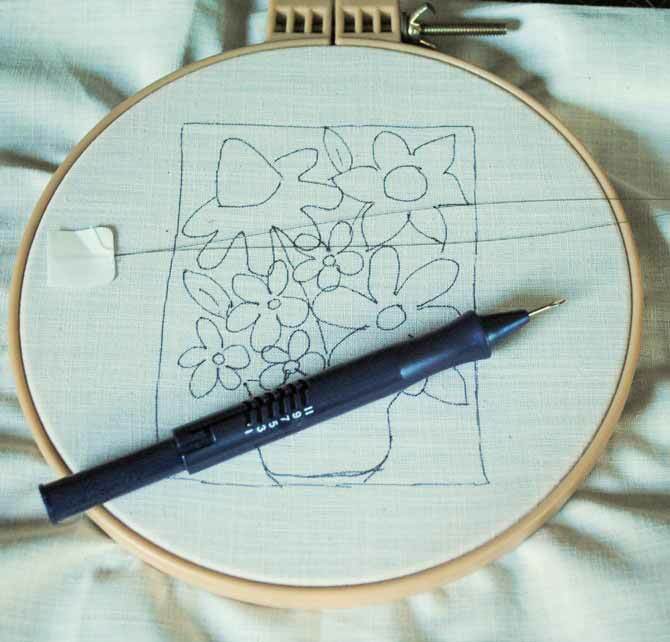 The puchneedle stitch is very simple and with a little practice, easy for almost anyone to master! 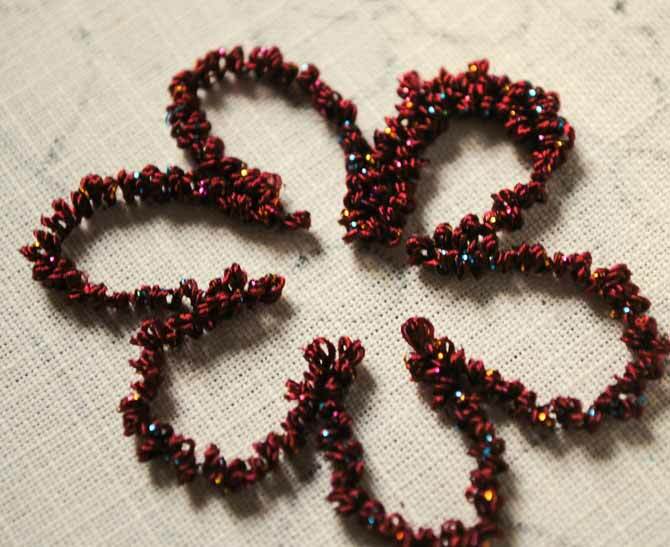 Watch my little video to see how you go about stitching with the punchneedle. 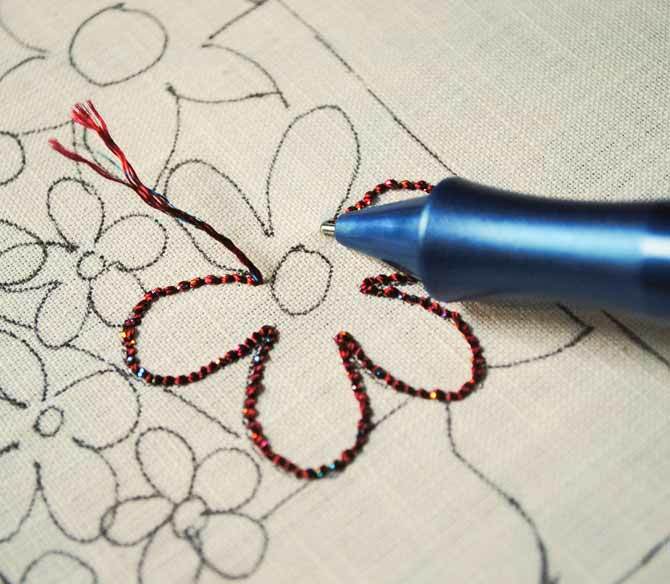 In this video, Christine Baker demonstrates how to do the punchneedle embroidery stitch with the Cameo Ultrapunch punchneedle. Here’s what the first stitches look like from the BACK of the punchneedle embroidery. Remember, you’re working from the back, so don’t get too discouraged if it doesn’t look all that great at first. The first punchneedle stitches – look at those sparkles! Even from the back of the fabric. Here’s the front, with just the outline of one flower finished. I LOVE how the Dazzle thread looks! That little glimmer of metallic thread is so different from what I typically use to do my punchneedle stitching. I can’t wait to see what the embroidery piece looks like when I’m all done! The back of the punchneedle piece shows how the lines of stitching are placed a needle’s width apart. On the front of the piece, the threads fluff out and take up more room, so you can’t tell that the lines aren’t right beside eachother. 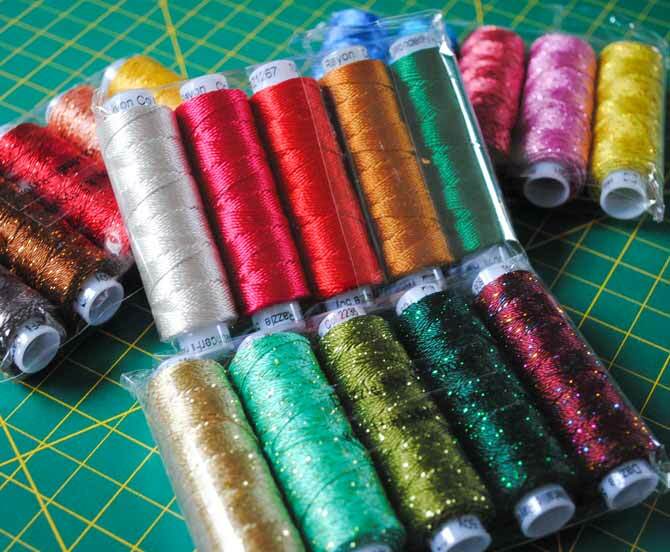 Here’s my collection of Razzle and Dazzle threads!! My friend Jean Boyd made me this wonderful sewing bag a couple years ago for our quilting group’s Christmas exchange. I just love how I can see all of the colors that I have through the clear pockets! So, I’m going to sit out here on my back deck and keep on stitching. Another great thing about punchneedle is that it doesn’t take long to stitch a small piece, so tomorrow I’ll have the embroidery done and I’ll show you a couple different ways that I incorporate my punchneedle pieces into quilted projects.